It's been a rough week here in the U.S., what with the Boston Marathon bombing, poison being mailed to government officials, and now a huge factory explosion in Texas. Times of tragedy and fear can really wear us down, individually and as a whole, but I'm glad the internet is big enough to provide little moments of joy and distraction even in the worst of times. I don't know about you guys, but I found myself cherishing those moments more than ever this week. 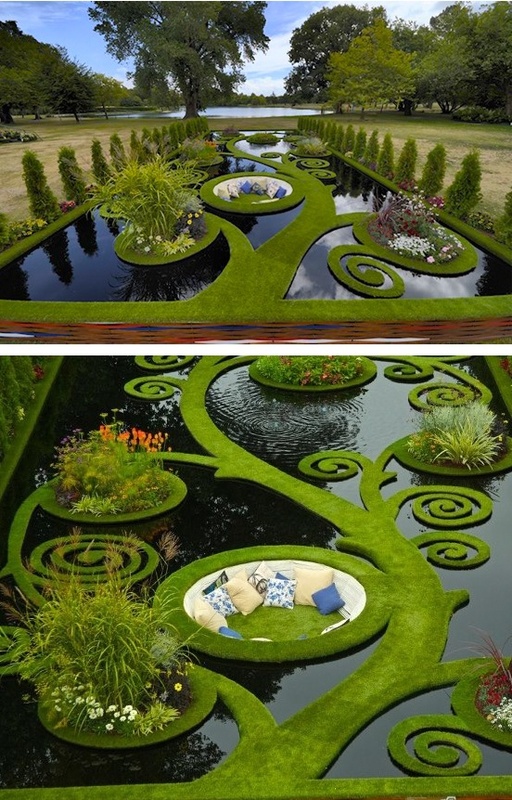 Look at that sunken seating area! My mind, it is blown. And I'm not sure I believe that's real grass; it looks too perfect. And soft. And I want to walk on it barefoot IMMEDIATELY. 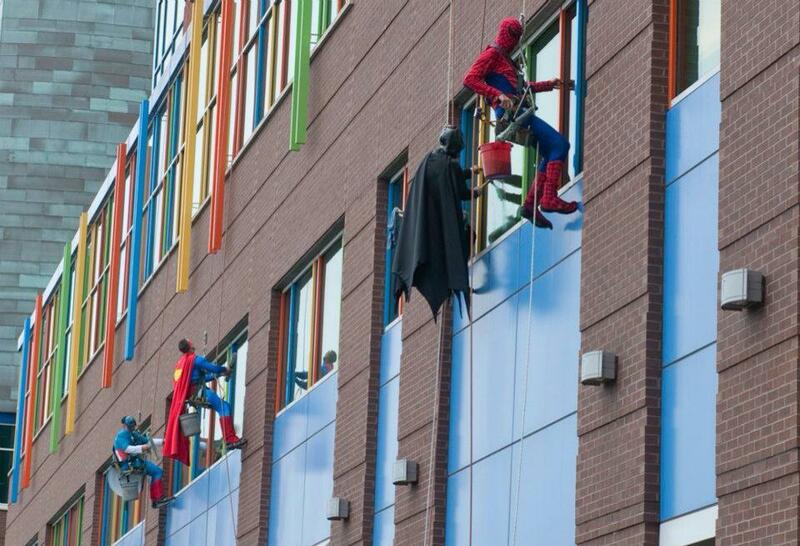 These are the window washers at the Pittsburgh Children's Hospital. [sniffle] I'm fine. Really. Pass the tissues. What better way to turn a geek into a big kid again than with some new Pop! vinyl toys from Funko? The Rocketeer! I love the green highlights in his eyes. These guys won't hit shelves 'til July, but you can pre-order them here for just under $10 each. Lots more over at NerdApproved, or hit the link up there to shop. I hope you all are safe and well and happy, and here's to a better week next week! I've got one of those pop figures - I was given elphaba aka wicked witch of the west as a Christmas gift cos I'm such an oz nerd. So adorable. Thanks, Jen, for being my Happy Place on the interwebs. 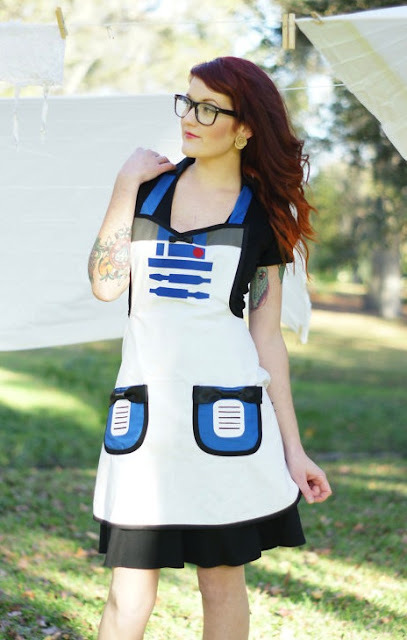 You have reinforced my desire to learn to sew. 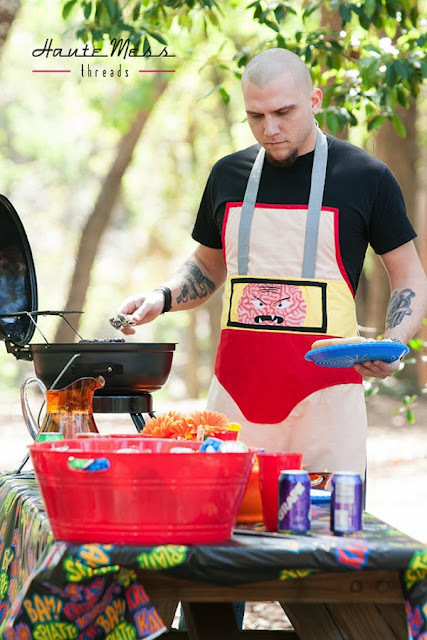 Those aprons are SO CUTE, but no way I could conceive of paying $150 for one. Thanks for giving this community a place to gather! I have to tell you I sent my mom the bra post. She was all like, FLIP FLOP HANGERS!!! Awww, lovely post. You always do the world good. While I do appreciate the Dove Beauty campaign I have to admit it does have its faults. I can't claim the thoughts presented in this link but I'm presenting this as another point of view. While I'm really, REALLY not against the Dove Real Beauty Campaign and I think anything that celebrates real women over retouched models and body types that very few women have is fantastic I agree with the other of this post that Dove is still presenting a biased western view of beauty. Why doves real beauty video makes me uncomfortable"
And I love that water garden... I want one! I thought I was going to be the first to call out the Dove campaign. I'm glad other epbot readers also see some of the flaws. Thanks for this, you articulated my feelings about it perfectly. Very interesting article Angel! I just started reading thisisthinprivilege blog and it has some good points. That Dove ad could be seen as mildly racist and body-biased("she had big beautiful blue eyes and was thin"). But, I was moved in the way the company intended me to be. I am studying nutrition science and am constantly surrounded by judgmental skinny girls. I am not skinny by any means, so I have a hard time feeling accepted or validated. Those Dove ads can often hurt one's feelings (thin is everything!) while intending to uplift the female race. THIS. I kept thinking to myself that we also don't know if the other people who were describing the experimentees knew what they were supposed to be doing and were therefore kinder in their descriptions. I kept wanting them to hang a photograph of the women next to the sketches as well, so we could see how accurate some of them were, for the reasons you listed above. (I mean, would an older person describe themselves younger, since that's where most of their experience is? Or harsher/older, because they've become more cynical of their looks, etc.?) Lots and lots of funding is needed! Ahh! 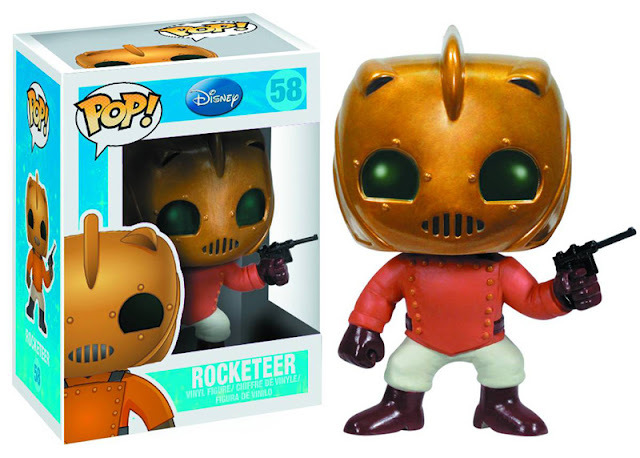 I am pre-ordering my Rocketeer now! I heart you! I really appreciate the stuff you find, the thoughts you write about, etc. Thanks for the uplift, Jen. Along with all the other nastiness, my town had its own crisis when a group of yahoos(not the company) decided to deliberately sever our fiberoptic phone lines, and then took potshots at the transformer. No phones, internet, ATM, credit cards, or cell use for at least 13 hours. It was more aggravating than horrifying, at least for my family. Thankfully they weren't able to take out 911. That would have been horrible. Sorry if this was a bit of a downer. What about the Patton Oswalt filibuster? I'm not even a Star Wars fan (I know, I know) and I couldn't stop sniggering at it at work. I love reading your weekly faves. I can always find something to make me grin. As for Dove, I'm probably way too cynical: my first thought was that the artist had probably been asked to make the first drawing look sad and the second drawing look happy. Ze Frank's face is so entertaining. That water garden... I don't think I'd ever leave it. The video of Ze Frank is awesome and totally inspiring! I love his facial expressions as he talks! I may have to get 1 or 2 of those figures...my fiance LOVES TMNT! That video was amazing. The website Beauty Redefined is something every girl should look up. I don't know how to add a link, but I hope this will do. The superhero window washers will never get old. <3 I loved that video by Dove, too. Sent it to all my family and they loved it. Good to be reminded that others don't see what we consider to be our flaws. And OMG how did I not know the TMNT were gonna become Pop! figures?!?! Must add to my wishlist! 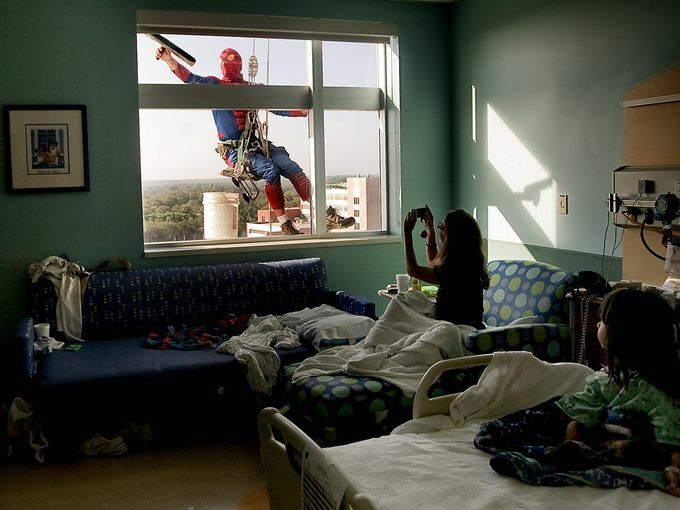 I love the superhero window washers! I can only imagine how a sick child must feel when he or she happens to look over and see their favorite superhero looking in lol It's a wonderful idea!